It's so hard for ADD people to concentrate on tasks some times, because every time something is touched, they think of something else to do. So just trying to say out loud to yourself, "Focus, focus, focus"-easier said than done, but give it a try. Having an organized environment for ADD people is certainly recommended in keeping control of their daily activities. It's a "Catch 22" for the classic symptoms of ADD: inattention, impulsivity, distractibility, overfocusing and hyperactivity, to name just a few. Everyone says "time management" but I like to call it "activities management." What we actually do is manage our "activities" within the "time" we have everyday. Makes sense? A common characteristic of a person with ADD is that he/she likes new things to keep them interested, so it's difficult to stay on task for very long-sometimes it ranges for 15-60 minutes. A simple strategy of using a timer to start and stop can help insure completion of the project started. Offering the client a reward for staying on task could be taking a short breaks and doing something else for 10-15 minutes. It's important that a reward is set up that the client wants and sometimes never finds the time to do. Using your internal clock (like the feeling someone knows when something should take a certain amount of time to do), is not an effective way for an ADDer to keep track of time. Using a clock to do something within an allotted period of time that has an auditory sound from a timer or a cell phone, for instance, is a way for the mind to be interrupted, so the individual can stop, look at their calendar, and/or "to do" list to do something else. It's a challenge for an ADD individual to calculate how long something takes and/or will take their time to do. Planning is important to keep on task and learning not to "overschedule" one's day. Approach a project by breaking it down into little pieces. So ask yourself, "How do you eat an elephant? Answer: "One bite at a time." If you can VISUALIZE this question and answer it each time when tackling a task and/or project, you will be able to manage your daily activities better so you can feel good at the end of each day. To control your daily activities as well as managing your time, it's important to say "no." Reward yourself each time to saying "no" to everyone's request if it will keep you from doing what YOU need to get done. Always acknowledge that person who asked you by saying, "I appreciate your vote of confidence, but I just can't work it into my schedule at this time. Sorry." Remind the client that complex organizing projects shouldn't be set up when he/she is not at their best. Setting up for "success" is the best. By working on a project that requires deep concentration, should be done during the time of day when the highest level of energy is felt. Staying healthy is very important to the ADD individual. Exercising helps relieve the stress for both physical and mental issues that is caused by daily activities and interruptions. By exercising and good nutrition, frees up the mind to take a much needed rest I call a "brain break," so a person can "refocus, regroup and rejuvenate." Sometimes letting calls go into voicemail will help insure concentration on the project at hand. By setting 2 times a day to return calls, will help put a "system" in place of creating a habit that can be a win-win situation for everyone. Keeping a notepad on a night stand, in your pocket, purse, etc., is extremely useful when ideas pop into one's head. It clears the mental clutter out, so you can focus on the task at hand that needs to get done by a certain timeline. Studies have been conducted that chewing gum can help one focus. Studies have been conducted that chewing gum can help one focus. Some people like to play with clear sparkly Silly Puddy in meetings tugging and pulling it in all directions to keep their hands busy because it helps people to focus. Besides, it really smells good--like bubble gum. Helping clients understand their focus limitations and how to work within their abilities, will help prevent them from getting caught up in the cycle of "never finish anything" syndrome. "Making it fun until it's done" is my strategy in helping my ADD clients feel good about themselves by keeping them inspired that they can accomplish anything if they have the right tools and the right attitude. "If you can't find it in 30 seconds, it's in the wrong place"
Evelyn Gray, Productivity Expert, Organizing Coach, Speaker, Trainer and Author, who specializes in working with professionals who have Attention Deficit Disorder (ADD/HD) and the chronically disorganized individuals. She obtained her Bachelor's Degree in Business Education from California State University, Los Angeles. Evelyn started organizing in her teens, where she always found tranquility in taking chaotic situations and breaking them down into "bite-size" pieces to make things easier and more pleasing to look at. 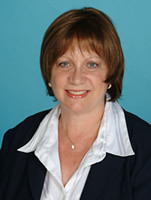 See Evelyn Gray's Profile on Experts.com.